Another aim of this research was to examine the kind of justifications the older participants use to support their tolerant stance. 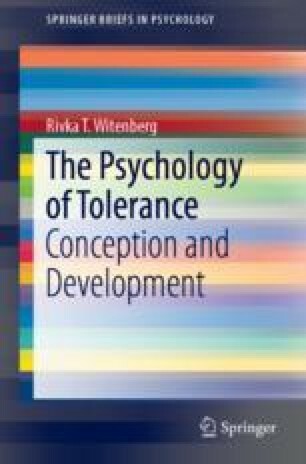 How tolerance is justified is very rarely examined in the psychological literature. However, as suggested earlier justifications offer an understanding of how tolerance is conceptualised as well as providing insight about ways tolerance can be promoted and protected. How younger students aged between six and seven justified their choices was reviewed in Chap. 4. This chapter deals with the responses of older participants between the ages of 11 and 25 in Australia depending on the specific study in question and nine to 24 in the Israeli study. Based on the research conducted about the kind of justifications used to support tolerance and intolerance, a key set of beliefs that are implicated in tolerance and acceptance have emerged which are more sophisticated than those the young children used. They are fairness (Justice, equity), empathy and reason/logic. In addition, the responses of adults with the average age of 30 years also influenced the overall findings. Butrus, N., & Witenberg, R. T. (2015). Some personality predictors of tolerance to human diversity: The roles of openness, agreeableness, and empathy. Australian Psychologist, 48, 290–298 (Published on line in 2013). https://doi.org/10.1111/j.17429544.2012.00081.x. Wark, G. R., & Krebs, D. L. (2000). The construction of moral dilemmas in everyday life. Journal of Moral Education, 24, 1, 5–21. http://theconversation.com/tolerance-is-more-than-putting-up-with-things-its-a-moral-virtue-31507. Witenberg, R. T. (2000). Do unto others: Towards understanding racial tolerance and acceptance. Journal of College and Character. [On-Line], 1. Available online at: http://www.collegevalues.org.